Ground shipping times are approximate. Does not apply to drop-shipped items. In Stock items only. Ground Shipping : West Coast (California, Washington**) Order by December 14th for December 24th delivery. Ground Shipping : Non West Coast** Order by December 19th for December 24th delivery. 2nd Day Air : Order by December 20th for December 24th delivery. Next Day Air : Order by December 21st for December 24th delivery. Free shipping only applies to orders within the contiguous U.S. and APO/FPO boxes. Metrokitchen may choose to use UPS ground or the United States Postal Service. 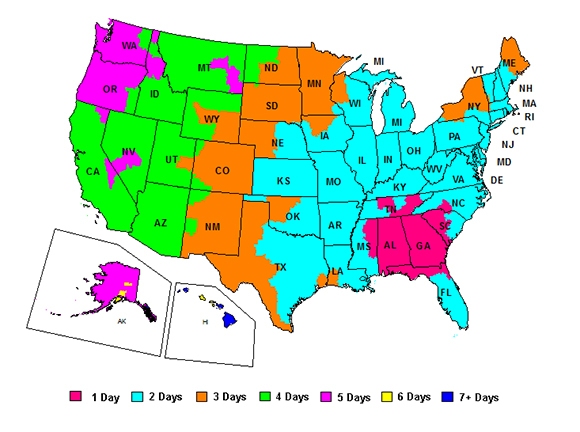 Free shipping does not apply to orders to Hawaii and Alaska, outside the contiguous 48 states. If part of your order is on back order and your order qualified for FREE shipping, you will not be charged for the shipment of that back order. Please note that all orders of $1000 and above will require an adult signature upon delivery by UPS. If you want to change a shipping address so a signature is more easily obtained, please call us immediately at 866-276-4550. We do ship orders received by 2 p.m. on the same business day. It's important to call us immediately if you need to change a shipping address as a result of this signature requirement. Please see section below on changing an address after an order has left our warehouse. On weekends or after normal business hours (10am to 5pm EST), please feel free to leave us a voice mail with your order number and address change or email the same information to: cs@metrokitchen.com with the Subject: Address change. WHAT IF I HAVE TO CHANGE OR CORRECT A SHIPPING ADDRESS? Because UPS now charges MetroKitchen $11 for each address change, we will pass the UPS charge onto you. You will see a separate charge on your credit card for $11 when you request an address change or an address correction. Please note that we ship the same business day for orders received by 2 p.m. EST. It's critical for you to contact us as soon as you realize that an address needs to be changed, since we ship so quickly. Shipping within the 48 United States and APO/FPO orders over $49.00 ship FREE to the 48 United States and APO/FPO boxes by UPS Ground. Orders under $49.00 ship for a flat rate of $11.95 to the 48 contiguous States and APO/FPO boxes by UPS Ground. Orders to Alaska, Hawaii and all US territories will be charged a flat rate of $19.95 for shipping. Orders to Alaska, Hawaii, and U.S. Territories have a shipping surcharge of $19.95. We offer discounted rates for and UPS Next Day and Second Day shipping, which will be displayed prior to checkout. We want you to have your order as quickly as possible, so our warehouse is fully stocked. Our goal is to send your order from our warehouse to your house within 24 business hours or SOONER after we receive your order. If we receive your order by 2 p.m. Eastern time on a business day, we generally will ship it the same business day as you placed your order! Ground Shipping - Orders are shipped within 24 business hours or SOONER after they are placed on our website. See our Ground Shipping Map for estimated transit times. UPS Second Day Air - Orders placed before noon Eastern time ship the same business day, and are delivered the second business day. Business days are only Monday thru Friday. UPS Next Day Air - Orders placed before 12:00 Noon EST ship the same business day, and are delivered next business day by 3:00pm. Business days are only Monday thru Friday. Air Shipping to Alaska and Hawaii may take 2-3 business days. Some rural areas do not have guaranteed delivery times for air shipping. This schedule does not apply to John Boos, Enclume, Ankarsrum, Capresso, Swiss Diamond, Dansk, Blendtec, Woll or VitaMix products because some of these items may ship directly from the manufacturer. Some products are out of stock and backordered. In this case, the backordered items will ship as soon as they become available. Your credit card will NOT be charged until the item ships. If an item on your order is on backorder, you will be notified by e-mail within 24 hours. If the backordered item is part of a larger order and a significant part of the order is in stock then we will split the order, ship what we have and backorder the out of stock portion of your order. You will not be charged any additional shipping for split orders due to out of stocks or back orders. * FREE ground shipping within the continental US.